Leprosy or Hansen's disease is a chronic infectious granulomatous disease with varied presentation, especially in the setting of lepra reactions. We report two such atypical presentations each of Type I and Type II Lepra reactions; the first being an elderly male presenting with fever, while the second case being of a young boy being evaluated for cervical lymphadenitis. In the postleprosy elimination era, it has become prudent that clinicians across specialties are alive to the possibility of Hansen's disease being a differential diagnosis to a plethora of otherwise unrelated infectious and auto-immune conditions. We report two such cases with atypical presentation of lepra reactions. The first was of an elderly male presenting with pyrexia of unknown origin and diagnosed as rheumatoid arthritis, while the second was that of a young boy being evaluated for tubercular cervical lymphadenitis, both of whom were given a dermatologic referral with appearance of skin lesions. 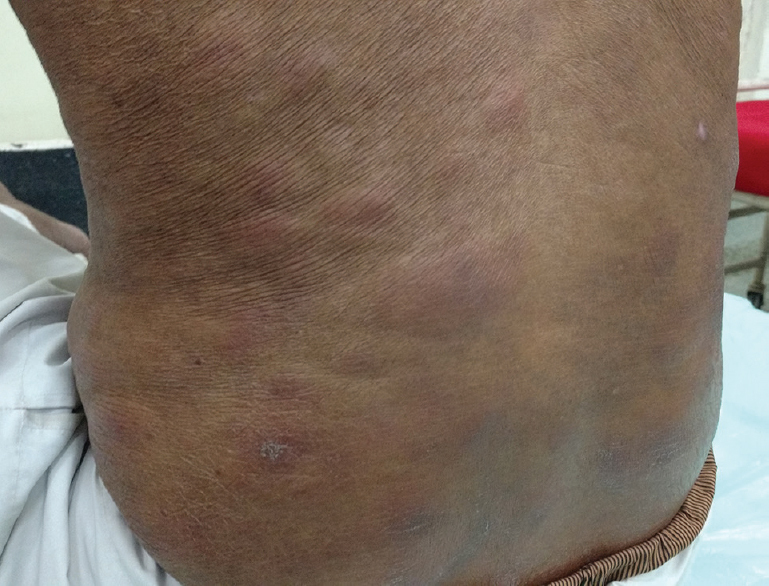 A 64-year-old male hailing from Jamshedpur (Jharkhand), a chronic smoker with no known comorbidities, presented with the complaint of fever with pain and swelling over the wrists and ankle of 2 months' duration. The fever was intermittent, low to moderate grade, without chills or rigors, and associated with bone pains predominantly those of extremities. On examination, he had mild pallor, bilateral pitting pedal edema, insignificant nontender generalized lymphadenopathy, and few tender skin-colored nodules mainly over the extremities. The patient also had tenderness to palpation over both shin bones. Investigations revealed a low hemoglobin of 9.8 gm% and a raised leukocyte count of 17,600/mm3, with differential counts of P74/L20/M04/E02. Blood for autoimmune markers was positive for rheumatoid factor (RF) and C-reactive protein (CRP) but negative for antinuclear antibody (ANA) screening. Serology for hepatitis B virus, hepatitis C virus, and human immunodeficiency virus was negative. Chest radiography, radiography of wrists and ankles, and sonography of the abdomen and pelvis showed no abnormality. All other investigations to rule out any focus of infection or systemic malignancy and routine biochemistry were essentially normal. The patient was empirically started on treatment for rheumatoid arthritis with oral prednisolone 15 mg daily and hydroxychloroquine 200 mg twice daily. However, after 10 days when he did not show any response and developed few new nodular lesions on the upper limbs, a skin consult was taken. Dermatological examination revealed slightly infiltrated face, lateral supraciliary madarosis along with multiple polysized erythematous-to-hyperpigmented patches, and tender nodules over the trunk and all the four extremities [Figure 1]. A detailed examination revealed patchy areas of hypoesthesia in a glove and stocking pattern along with thickened but nontender left ulnar and both common peroneal nerves. History was reviewed again and on asking leading questions, he said to have had a reaction to some drug 6 years back following which he developed multiple round swellings on the body, along with fever and arthralgia which healed with dark pigmentation. Slit-skin smear for acid-fast bacilli (AFB) (lepromatous) was found to have a bacteriological index of 4+. Skin biopsy for histopathological examination was consistent with erythema nodosum [Figure 2]. He was diagnosed as a case of Hansen's disease Lepromatous (LL) in Type-II lepra reaction (erythema nodosum leprosum) and was started on WHO multibacillary multidrug therapy (WHO MDT) along with tablet thalidomide 100 mg three times daily, oral nonsteroidal anti-inflammatory drugs, and oral iron supplementation. The patient became afebrile within 72 h and all the nodular lesions subsided, leaving postinflammatory hyperpigmented macules over the next 10 days. A 16-year-old boy presented to the otorhinolaryngology outpatient department with painful swelling on the right side of the neck of 6 months' duration and pus discharge from it of 2 months' duration. The swelling was insidious in onset, associated with mild pain, and gradually progressed over the next 4 months to a size of a small lemon, after which it spontaneously ruptured to discharge serosanguinous-to-frank pus intermittently. There was no history of low-grade fever, night sweats, or weight loss. Initial examination revealed a 2-cm swelling over the right side of the neck on the posterior aspect of the mid one-third of the right sternocleidomastoid muscle. There were overlying multiple sinuses with purulent discharge. The patient was evaluated for cervical tubercular lymphadenitis which revealed a normal chest radiograph, a Mantoux test of 4 mm induration, an erythrocyte sedimentation rate (ESR) of 10 mm fall by Westergren method, and an MTB polymerase chain reaction (PCR) of the discharge which was negative. Fine-needle aspiration cytology (FNAC) from the lesion suggested granulomatous lymphadenitis but negative for AFB on Ziehl–Neelsen's stain. The patient was further planned for sonographic imaging and lymph node excisional biopsy. During his evaluation, the patient developed a pink-colored patch over his right cheek for which a dermatology consult was sought. Examination revealed a solitary, well-defined, erythematous, hypotrichic, hypohidrotic, but norm esthetic circular patch measuring 5 cm in diameter over his right cheek. There was a ruptured swelling with serosanguinous discharge over the right greater auricular nerve which had cord-like thickening [Figure 3]. Other peripheral nerves such as left greater auricular, right ulnar, and right common peroneal nerves were also thickened but nontender. Slit-skin smears for AFB (L) were negative. 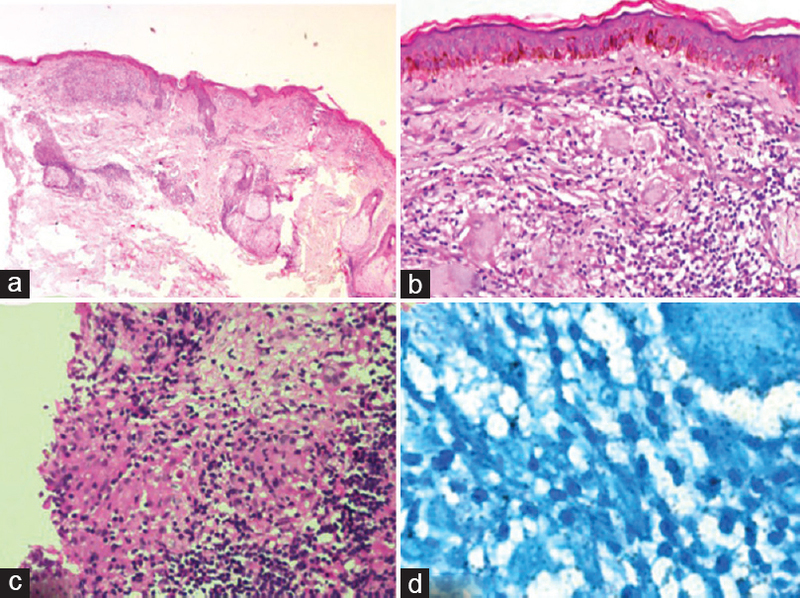 Histopathological examination of a skin biopsy from the patch on the right cheek was consistent with the diagnosis of Hansen's disease (borderline tuberculoid [BT]) [Figure 4]. He was diagnosed as a case of Hansen's disease (BT) in Type 1 lepra reaction in the form of right greater auricular nerve abscess and was managed with WHO MDT and tapering doses of oral corticosteroids. Leprosy has been traditionally described as a chronic infectious disease of peripheral nerves and skin. However, the multisystemic involvement by different spectra of the entity, especially in the setting of lepra reactions, can often mimic many diverse unrelated conditions. Our first patient was an elderly male who presented with intermittent fever with symmetric small joint polyarthritis of 2 months' duration. Musculoskeletal symptoms are the third most common presentation after cutaneous and neurological involvement in leprosy and at times maybe the only or preceding symptom. Chauhan et al. have classified the arthritis in leprosy into Charcot's arthropathy secondary to peripheral sensory neuropathy, swollen hands and feet syndrome, acute polyarthritis of lepra reaction, and chronic arthritis from direct infiltration of the synovium by lepra bacilli. Some uncommon rheumatic presentations include tenosynovitis and sacroiliitis., The incidence of arthritis in lepra reactions (especially Type II) is as high as 57% and mimics rheumatoid arthritis in being acute in onset, with symmetrical inflammatory polyarthritis of small joints of hands and feet. This is further compounded by the false positivity of autoantibodies such as CRP and RF as in our case. Other autoantibodies which can be falsely positive in leprosy include anti-streptolysin-O, ANA, anti-neutrophil cytoplasmic antibody, anti-double-stranded DNA, antimitochondrial antibodies, and antiphospholipid antibody, However, subtle signs can differentiate the two, such as absence of rheumatoid nodules, appearance of new erythema nodosum leprosum lesions over the face and upper limbs (as opposed to erythema nodosum lesions over the lower extremities), anesthetic patch or glove and stocking anesthesia, AFB on slit-skin smears, and lack of response to disease-modifying antirheumatic drugs. Additionally, anti-cyclic citrullinated peptide positivity is more specific for rheumatoid arthritis. Other systemic mimics include collagen vascular diseases such as systemic lupus erythematosus and antiphospholipid syndrome where patients can have malar rash, arthritis, photosensitivity, and false-positive autoantibodies. Our second case was that of a young boy presenting with right-sided painful cervical swelling which spontaneously burst to form multiple sinuses discharging serosanguinous and purulent material. Three important structures in the posterior triangle of the neck can potentially present as a swelling, namely greater auricular nerve, cervical lymph nodes, and external jugular vein. Greater auricular nerve is a pure sensory nerve originating from the cervical plexus (C2–3) and commonly affected in leprosy and less commonly in tuberculosis. Cervical lymphadenopathy (especially caseating tubercular) and external jugular vein thrombosis are close mimics which can often confuse the clinician. The absence of raised ESR, a negative Mantoux test, and MTB PCR further escalated the diagnostic dilemma. Although histopathologic examination of a nerve biopsy is ideal, most nerves are unsuitable for biopsy either because of their relative inaccessibility or potential damage to motor and sensory nerve fibers. However, FNCA being a minimally traumatic investigation is a worthwhile work around, yielding important information about leprotic inflammation. In our case, the FNAC of the swelling revealed granulomatous lymphadenitis, which did not corroborate with the preceding line of investigation. Imaging modalities such as ultrasound and magnetic resonance imaging can help demonstrate asymmetrical nerve enlargement, fascicular abnormalities, diffuse/focal hypo-echogenicity, and hyperechoic foci indicating nerve abscess, In our case, the patient was listed for ultrasound and lymph node biopsy, when the appearance of a solitary erythematous patch over the right cheek prompted skin referral. It was at this stage that the chord-like swelling of the greater auricular nerve also became apparent. Nerve abscess is a rare complication of leprosy. It can occur in all forms of leprosy, but most commonly occurs in tuberculoid and BT forms, with ulnar nerve being the most frequently involved peripheral nerve. The first case demonstrates one of the important protean manifestations of leprosy in the form of rheumatoid arthritis, especially more so in the contemporary context of prebiologic screening in endemic areas for leprosy. 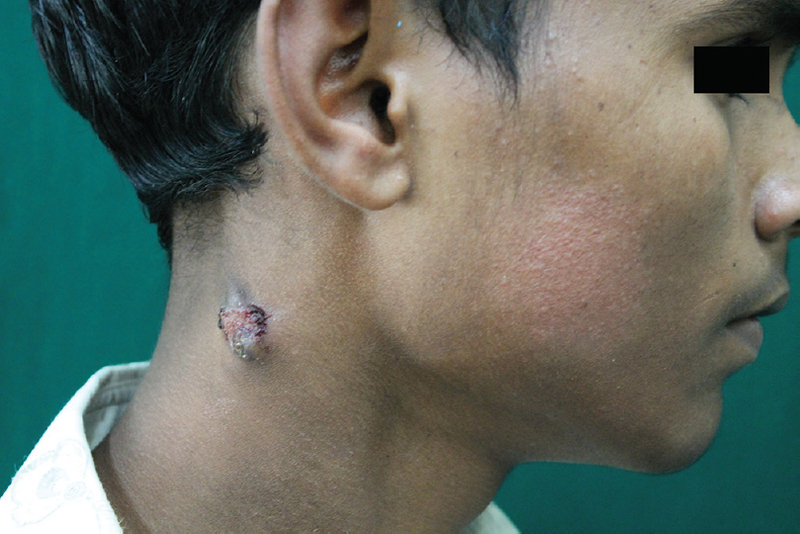 The second case highlights how an isolated nerve abscess can masquerade as necrotizing lymphadenopathy, if not for the late appearance of a leprous skin lesion. 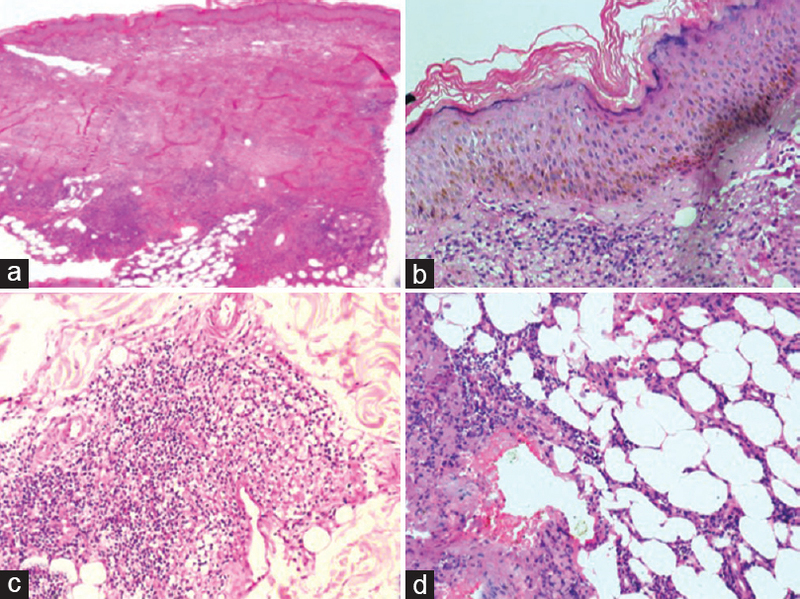 Salvi S, Chopra A. Leprosy in a rheumatology setting: A challenging mimic to expose. Clin Rheumatol 2013;32:1557-63. Vengadakrishnan K, Saraswat PK, Mathur PC. A study of rheumatological manifestations of leprosy. Indian J Dermatol Venereol Leprol 2004;70:76-8. Chauhan S, Wakhlu A, Agarwal V. Arthritis in leprosy. Rheumatology (Oxford) 2010;49:2237-42. Baveja S, Bisht PB, Sood A. Tenosynovitis: An unusual presentation of leprosy. Int J Mycobacteriol 2017;6:196-8. Rath D, Bhargava S, Kundu BK. Leprosy mimicking common rheumatologic entities: A trial for the clinician in the era of biologics. Case Rep Rheumatol 2014;2014:429698. Karadeniz A, Lally L, Magro C, Levy R, Erkan D, Lockshin MD, et al. Lepromatous leprosy mimicking systemic lupus erythematosus: A clinical pathology conference held by the division of rheumatology at hospital for special surgery. HSS J 2014;10:286-91. Maurya PK, Kazmi KI, Kulshreshtha D, Singh AK, Malhotra KP. Isolated thickened greater auricular nerve due to leprosy. Neurol Sci 2016;37:649-50. Siddaraju N, Sistla SC, Singh N, Muniraj F, Chahwala Q, Basu D, et al. Pure neuritic leprosy with nerve abscess presenting as a cystic, soft tissue mass: Report of a case diagnosed by fine needle aspiration cytology. Diagn Cytopathol 2009;37:355-8. Lugão HB, Frade MA, Mazzer N, Foss NT, Nogueira-Barbosa MH. Leprosy with ulnar nerve abscess: Ultrasound findings in a child. Skeletal Radiol 2017;46:137-40. Sen D, Satija L, Chatterji S, Majumder A, Gupta A, Kumar A, et al. Ultrasonography and magnetic resonance imaging of ulnar nerve abscess in leprosy. Med J Armed Forces India 2016;72:78-81.